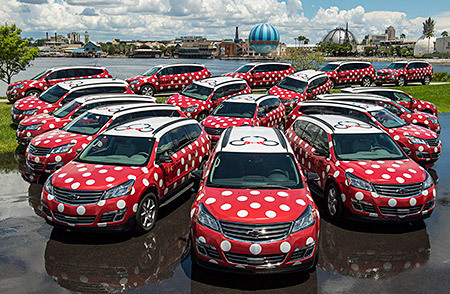 Recently introduced at the resorts, possibly to counter the upsurgence of Uber journeys and to bring some of that revenue back within the company, Walt Disney World now owns and operates its own fleet of mini vans (“Minnie” vans, get it?) which can quickly and easily get you from point to point within Walt Disney World property. This service is especially useful if you are trying to get from one resort to another for a meal or other reservation, as otherwise the bus, ferry and monorail options for non-park destinations can get rather convoluted. 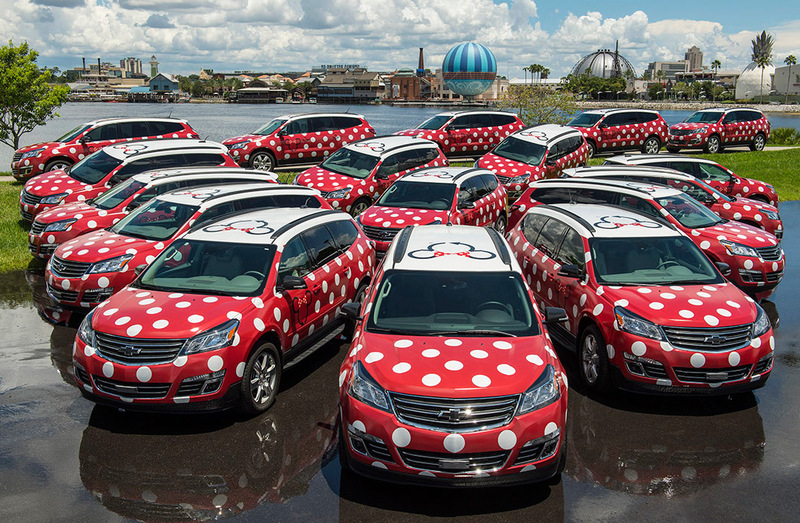 The vans are bright red with white Minnie Mouse polka dots, so are very easy to spot [groan, sorry!] and are driven by Disney-employed Cast Members. To make hailing a van simpler, Disney has teamed up with the Lyft ridesharing service, so all you need to do is install their app onto your smart phone and open it anywhere within WDW grounds. You can then request a ride from your current location and you will be given an ETA for your van to arrive — ideally within just a few minutes. The original tariff was a fixed fare of $25, but that has now changed to a $15.00 base fee plus $2.75 per mile traveled. This fare covers up to six passengers travelling anywhere within Walt Disney World property and is paid via the app. No tip is required. External destinations, such as shopping malls or airports, are not available. All of the vans carry two child seats, and Wheelchair Accessible vans are also available but you need to specify that when requesting a pickup. The service is available from 6:30am until 12:30am daily. For more information, see the Disney Minnie Van web page. Taxis are another alternative, and there are usually cabs waiting just outside the resort, or available very quickly if you get a cast member to call one for you. If you travel somewhere by cab, it might be a good idea to get the driver to provide you with details of how to request your return trip. For an idea of prices, you can check your journey in advance using a fare calculator. However as a guideline, expect to pay $40-$50 plus tip each way for most of the Orlando area attractions, or $10-$15 plus tip for an internal Disney World trip (for example getting to other Walt Disney World hotels for early breakfasts, or getting back to your resort late at night). Uber is also a very popular choice, and is generally reported to be much cheaper than getting a regular taxi or a Minnie Van. The LYNX company provides a useful public bus service in and around the Orlando area, including one route which serves Walt Disney World. Check out their website for more details: www.golynx.com. Lynx tickets cost $2 per one-way trip, regardless of distance. If you need to change to another Lynx service for your journey, ask for a transfer ticket. Two of the most useful services for Disney guests are the Link 50 which runs from Walt Disney World to Sea World, along part of International Drive and then to downtown Orlando, and the Link 111 which serves Sea World, the Florida Mall and Orlando International Airport (but no longer goes as far as Walt Disney World). Both services run every 30 minutes or so and route maps and timetables can be found at Link 50 service and Link 111 service. The two easiest Disney pickup points for the Link 50 are at the Transportation and Ticket Center (next to the Magic Kingdom’s parking lot monorail and ferry terminals) or more conveniently for Port Orleans guests, at Disney Springs just opposite the Disney bus stops near to the Rainforest Cafe. There is a LYNX request stop just over the road on Buena Vista Drive, right next to the traffic lights for Hotel Plaza Boulevard and less than five minutes walk from the Port Orleans river ferry dock. It will soon be more easily accessible via a new footbridge over the main road. From outside Sea World you can catch the Link 8 bus (or perhaps the tourist I-Ride Trolley service, although you’ll have to pay extra for that) which runs the length of International Drive, including both of the Orlando Premium Outlets Malls (Vineland Avenue and I-Drive) and Wet ’n Wild. For a local supermarket visit, you can get a bus to the West Vine Street Walmart in Kissimmee (on SR-192). From Disney’s Transportation and Ticket Center, take the Link 56 service and get off at the stop after Medieval Times and walk across the parking lot. Another option would be to the use the Mears shuttle bus service, which costs around $18 per person for a return trip to places like Sea World or Universal. You phone them the day before (on 407-423-5566) to book a pickup time slot and they come directly to your hotel to collect you. Then you phone them again two hours before you want to go home and they’ll give you another time slot for collection. Even if you use Disney’s Magical Express for transfers to and from the airport, renting a car for a few days within your stay is a great way to get out and about for those essential shopping excursions and visits to the other Orlando-area tourist attractions such as Universal Studios and Sea World. Most of the major car rental companies have offices located within Walt Disney World property, and often they will provide a courtesy transfer service from your hotel if you give them a call. Disney’s official car rental agencies are currently Alamo and National, both of which are located at the Disney Car Care Center near to the Magic Kingdom parking lot. Disney offers a complimentary shuttle service from the Transportation and Ticket Center to the Car Care Center, and also by request from the theme parks. Otherwise, Dollar and Avis offer probably the most convenient locations for guests staying at the Port Orleans resorts, with sites located at the end of Hotel Plaza Boulevard, both a very short walk from the Disney Springs Marketplace bus stop and the Sassagoula Ferry dock. Dollar Rent-a-Car: Wyndham Resort Hotel, Hotel Plaza Boulevard. Very convenient from Port Orleans, just a few minutes walk from the Disney Springs ferry dock. Avis: Hilton Hotel, Hotel Plaza Boulevard, also a short walk from the Disney Springs ferry dock. Enterprise: Royal Plaza Hotel, further down Hotel Plaza Boulevard. National Car Rental: Disney Car Care Center near to the Magic Kingdom parking lot, or the Dolphin Resort Hotel near Epcot, or the Buena Vista Palace Hotel in the Bonnet Creek Resort area. Alamo: Disney Car Care Center near to the Magic Kingdom parking lot, the Dolphin Resort Hotel near Epcot, or the Buena Vista Palace Hotel in the Bonnet Creek Resort area. Hertz: Hilton Hotel in the Bonnet Creek Resort area. Note: if you plan to hire a car for more than 4 days, it might be worth checking out what weekly rates the companies offer, as that can often work out a better deal. If you are hiring a car straight from the airport, you may want to take a look at our Travel Directions page for suggested driving routes.